De Anima(L) is a rich novel that begins as a tale of campus hijinks and evolves into an exploration of contemporary ambiguities. 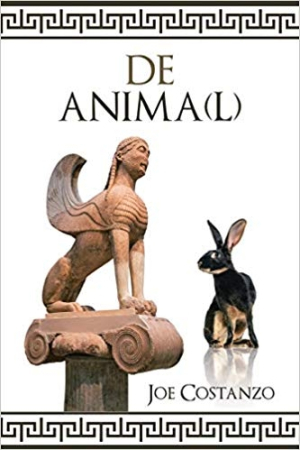 Joe Costanzo’s De Anima(L) is a sophisticated, character-driven novel—a blend of a campus mystery with a philosophy professor’s belated education in living. Edward Stathakis has retired early—from the world. He’s had no serious relationships since his divorce twenty years ago and has spent decades as adjunct professor hopping from gig to gig. His current position at a small Christian college came with the hope of a longer stay and the golden charm of teaching his preferred subject: philosophy. All goes well until an innocuous lecture on ethics inspires animal rights-minded students to liberate the team mascot, a rabbit. Their prank is followed by property destruction, ominous warnings, and the loss of life. Edward finds himself at the center of a career-threatening web that involves campus politics, police interrogation, and the powerful reach of the town’s wealthiest families. The book is spot on about capturing the pressure-cooker atmosphere of small town college life. It’s even more adept at handling the large and varied cast of characters thrown into the cauldron. When questioned by police, Edward realizes how little he knows about his students. Through Edward’s eyes, eleven different characters are efficiently introduced, also adding to Edward’s characterization through his illuminating his thoughts on each. As the story moves forward, hidden personality traits and a welter of tangled relationships among the students are gradually brought to light. Also in the cast are a gay math professor whose partner is discreetly ignored for fear of putting off donors and whose sister Edward has a tender crush on; a woman detective who is caring but tough, especially where Edward is concerned; and two wealthy patrons whose financial support the college depends on. Edward is especially well drawn as a man who is winning in his guileless earnestness and sympathetic in his near isolation. Edward is deserving of more than life has thus far given him yet finds contentment in what it has. The book is well paced, delivering twists and surprises that keep pages turning while dropping in new elements that make foregone conclusions impossible. The plot flows from the characters’ actions and alliances, marred only twice by incidents that seem less than organic. These incidents both involve women who decide Edward is irresistible and work to seduce him, and are out of sync with Edward’s character as well the women’s, coming off as red herrings. While the who-did-what of the plot holds interest, a rich under-story also emerges. It becomes clear that the same tragedy and misfortune that have turned Edward’s life upside down have also, ironically, cracked open the shell of his circumscribed world. The series of events forces Edward to confront the ethical conundrums and choices he’s previously confronted only in theory. The end, though ambiguous, underscores Edward’s readiness for a new beginning.